oh i need some advice and guidance with this! Thread: oh i need some advice and guidance with this! oh boy ladies and gents this gal needs some help! i have been asked to make a queen sized quilt for a gal's DD for Christmas. DD wants wolves. i have a wolf panel that is i think 45x36. here are some of the colors that i have 'auditioned' to go with it. problem is, ive NEVER made a quilt from a panel so henceforth i dont have a dang CLUE what kind of pattern to use! and of course i don't have EQ7 yet either. im stuck with graph paper. im not sure all of these colors will fit in either. i dont want so much its obtrusive but i dont want plain and drab either. my lqs instructor has told me i need small medium large light medium dark and i should try and incorporate all 6 values into a quilt. can any of you give me some advice here? pointers? arrows? circles? directions? im just stumped here! thank you! I have a deer panel that has blacks, blues, gray and white in it so I am using graph paper and so far have auditioned a disappearing nine patch block to go around it or a lovers knot block using blacks, blues and white. Have not put together any blocks yet to see how it looks, like I said laying it out on graph paper. I am thinking I want the blocks to be either 10" finished or 12" finished. Hope this gives you some ideas. Print out a picture of the panel and use it in a preliminary sketch. That way you can see how the colors and design will work with it. Hopefully you have colored pencils or crayons that are similar colors to your fabric. Once you've got the deign in mind you can draft on graph paper to get the dimensions and measurements finalized. http://www.ddcountryquilts.com/quilts/wolf_calls.htm made by D&D Country Quilts. It's gorgeous. I found the same panel and plan to use similar log cabin blocks in greys, blues, purples, etc. I think the D&D quilt is queen size but I need to figure how to downsize to a twin. I like your fabric selections but I would use black instead of the dark brown and gray instead of the green. Try searching for "wolf quilts" and see if you find some inspiration like I did. Last edited by sak658; 07-12-2013 at 05:09 PM. How about surrounding the panel with the Lovely Leaves blocks demoed by Jenny Doan from MSQC? Sak658, your quilt is beautiful and would also be pretty with the wolf panel! Last edited by Tartan; 07-12-2013 at 05:08 PM. That should become a really pretty quilt! You've done a really good job of picking up the colors from the panel. Not too sure about the second fabric from the right though. It doesn't quite seem to fit. Maybe look for a bit darker mottled brown. I would use only small pieces of the bright yellow. (It would be perfect for the center of a log cabin or D9P). Like the suggestion of adding black and possibly a medium gray to your colors. You might also look for a blender with very dark green and a medium brown. Not essential but could be a nice addition. Do keep us posted as to what you're doing with this! 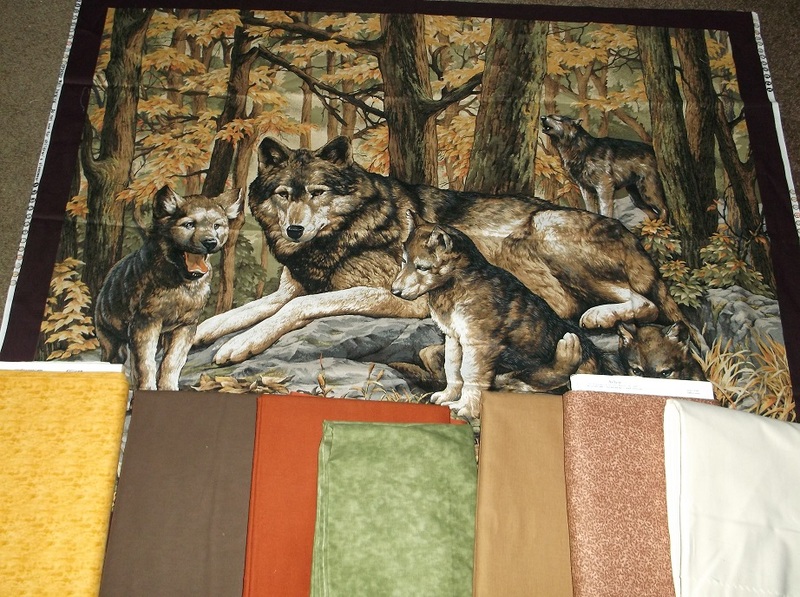 Google Images has these pictures of quilts with wolves. These might give you some ideas. I like the log cabin block idea because you could incorporate many of the colors you have. How you use the blocks would depend on how large you want to make the quilt. You could keep the brown but add a narrow black border around the panel to "frame" it and set it off from the blocks. The panel is so beautiful I think it should be your main focal point. Where did you get it. My son in law collects wolf things. These are some GREAT ideas Ladies. I always find google images comes up with some wonderful pictures. But my favorite so far is sak658. It is awesome! Love the quilt board. You Ladies and Gents are always so helpful! Good Luck terri bb, that sure is a pretty panel. Also agree, I like the idea of adding in a bit of black also. I used Bonnie Hunter's strip twist pattern (free on www.Quiltville.com) using colors from a nature panel for DH's quilt. It worked great. There are so many great ideas on this thread. Thanks. It helps me with some panels I have. Just make sure whatever you do that the blocks you use will match within the size of the panel. Once I didn't check my panel size and I had already cut the fabric that I wanted to use and I had a heck of a time adjusting to the size of the panel. So now I always check the size of the panel and adjust my block size from there. Hope you post a photo of the finished quilt. I love seeing what others do with their panels. This is going to be a nice quilt! When I first looked at the panel and your fabric choices.. I'm thinking, a bit of camo fabric in the colors of the panel would be a neat outside border. Just a thought. I like the suggestion that AnitaSt gave.... the log cabin block really focus the panel well. And I LOVE the colors you've chosen.... good job... and don't forget to keep us all posted. I like the log cabin blocks that AnitaST showed. That is teriffic. 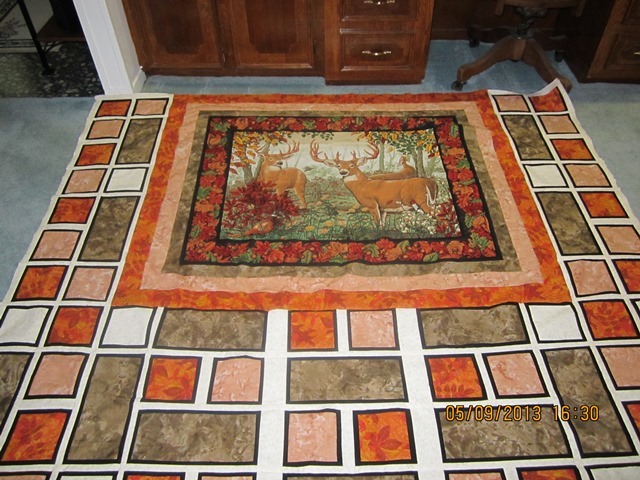 I did my deer quilt with a tea leaf and tulip pattern. You can look at it by clicking on my name and clicking on it in my latest threads started. I'd send you a link but, I don't know how. I also like the idea of a French braid border with some solid borders separating it. Good luck!!! Look up "Paws in the Wild" on Craftsy. It uses a panel. I bought the pattern I liked it so much. Last edited by Mitch's mom; 07-14-2013 at 05:22 AM. I would use colors picked from the panel. I would make a number of borders varying each one and maybe putting in a narrow border every once in a while to calm things down. [QUOTE=GoBragh;6176400]Just make sure whatever you do that the blocks you use will match within the size of the panel. Once I didn't check my panel size and I had already cut the fabric that I wanted to use and I had a heck of a time adjusting to the size of the panel. So now I always check the size of the panel and adjust my block size from there. outer blocks. Hope that makes sense. There was a wonderful baby quilt using a panel and 4-patch posies out of extra panels. You might try pinwheels or just several border out of your chosen colors. My first thought would be to use 9" blocks since 45 & 36 are both divisible by 9. No comment on the colors as that is always my struggle. The panel is wonderful. Be sure to show us pictures when you are done. I'm not sure which quilt pattern, however, I would add black and change the white to cream, it's almost too bright in my opinion. I would also add some grey, if possible, maybe eliminating the orange. There are just so many choices, I'm not sure if I have helped or confused you.